The review of the GX7000 is exactly why we started this website. Available in 4 different styles the Grays GX 7000 is a confusing hockey stick to review, let alone to buy online. That was until I put this together to help you. BE CAREFUL to understand which Grays GX 7000 you want to suit your style and the be DOUBLY careful to buy the right one, if you are buying online. No one in this industry seems to want to make it easy for people. However DO NOT BE PUT OFF making the choice to buy a Grays GX 7000 hockey stick because it is a beauty and other than making it a minefield to buy online Grays insistence on giving you choice is really great because it gives you a fantastic hockey stick with different head shape, curve and bow position to suit 4 different types of player. I will explain the different choices you can make with the Grays GX 7000. First lets look at what is consistent across all of the hockey sticks. All sticks in the GX7000 range from Grays have the same material composition. Grays have stopped detailing exactly what mix is included in their sticks but the GX7000 previous models were 80% carbon, 10% fibre glass and 10% aramid. There is no reason why this would have reduced and if anything the lack of any direct reference to fibreglass on the Grays website would suggest there isn’t. Though based on the performance of the stick I would say the previous composition has been retained. Grays have a great reputation of being long lasting hockey sticks. The GX7000 features a technology called AR Durazone. This is basically one of the areas aramid is inserted in the stick, to improve durability of the areas of a hockey stick that get battered. The head and the heel have this protection to help prevent deterioration. It’s not foolproof but it does help protect your investment in a Grays GX7000 stick. Noticeable on Grays hockey sticks is the soft touch and grip the head has on the ball. Improving your ability to receive the ball under control and dribble, Grays have a feature called IFA “Improved Feel Area” on the GX7000 sticks. Many hockey stick brands make an effort to improve this area of control. Grays is one of the better options, not only for the actual usefulness of this technology but also how long it lasts. In both instances the GX7000 performs well. All Grays GX7000 hockey sticks have the Energy Reduction Handle. 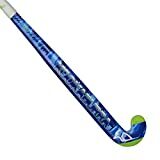 This is designed to minimize the vibrations you get through the stick when hitting the ball (or in a nasty stick tackle). To be honest if you hit the ball wrong you will always get vibrations, however Grays do make an effort with this technology to help. You can choose from 4 different shaft bow types on the Grays GX7000. Out of 5 available from Grays you get a feeling that the GX7000 is so popular for the other technology that it has to come available in all the shapes. Grays GX 7000 Probow review – The Probow is a low bow shaft. The stick is quite straight right down from the top of the handle to 200mm from the ground where it takes a distinct 24.75mm curve out to the head. Head shape on the GX7000 PROBOW is Micro. The Micro head from Grays is slightly thinned than the maxi which makes it feel better for scooping under the ball in little 3D dinks over sticks. It is slightly smaller too, so you need to be more accurate with hits. Grays GX 7000 Jumbow review – Grays Jumbow is one of the coolest available in my opinion. This shaft shapes a lovely 24.75mm curve right from the top the stick to the head. It’s main pivot point is over 300mm up, coming in again distinctly at 200mm up. It makes a really nice rounded shaft all the way down. Grays GX 7000 Dynabow – Dynabow shaft positions the curve slightly higher at 250mm up from the ground and here it takes a distinct 24.75mm curve. It is still a low bow stick and more like the Probow where it is straighter down to the curve then turns distinctly. Similar also to the Probow the GX7000 Dynabow has the Micro head which is thinner at the toe and slightly smaller reducing the sweetspot but increasing the effectiveness of the hit should you catch it right. Grays GX7000 Standard bow review – For those who like a straighter stick you can get the GX7000 in the Grays standard bow shape. It does make it a very high specification straighter stick. The curve is just 20mm and positioned 250mm up. To go with the straighter bow, this version of the GX7000 has the Maxi head so is a little more forgiving on it’s sweet-spot and larger to give you more chance of receiving the ball more often. You can click through to any of the different versions of the hockey sticks to get more information on how they suit each player. Grays “light” is heavier than other brands. If you are only interested in a really light stick Grays might not be for you. Another fantastic Grays hockey stick, the GX7000 is brimming with technology. A great choice for the player who wants the best chance of keeping a stick in good condition thanks to the AR Durazone technology. With a choice of shaft positions and head shapes Grays are offering the GX7000 to suit a number of player styles and this is a great sign that the background features which is common in all the options is really solid Grays technology, as always.